Different types of splints are used for management of various musculoskeletal conditions. Splints are noncircumferential immobilizers. That means they do not cover the limb they splint circumferentially, unlike cast. Because of being non-circumferential, they can accommodate the swelling that might arise after the injury. In this sense, they are more forgiving and safer than casts. Splints are commonly used for injuries of limb, for acute fractures or sprains both, either as definitive treatment or definitive treatment. The purpose of splinting acutely is to immobilize and protect the injured extremity, aid in healing, and lessen pain. Different types of splints are used at different sites. Though they are not circumferential, splints can still cause many complications and patient needs to be monitored after application. Moreover, the complications of immobilization like joint stiffness, muscle atrophy, or more severe complications, such as complex regional pain syndrome may occur with splinting also. Splinting begins by placing the injured extremity in its position of function. It is important to maintain good anatomic fracture alignment. Ulnar gutter splint begins at the proximal forearm and extends to just beyond the distal interphalangeal joint. It is used for undisplaced, stable fractures of the head, neck, and shaft of the fourth or fifth metacarpal with mild angulation and no rotational deformities. It can also be used soft tissue injuries of the fourth or fifth, proximal or middle phalanx. For the splint, the wrist is slightly extended with the metacarpophalangeal joints in 70 to 90 degrees of flexion, and the proximal interphalangeal and distal interphalangeal joints in 5 to 10 degrees of flexion. Nondisplaced shaft fractures and serious injuries of the second or third, proximal or middle phalanx; initial immobilization of displaced distal radius fractures. The splint is put along the radial aspect of the forearm and extends from just beyond the distal interphalangeal joint of the index finger, leaving the thumb free. Proximally, the extent is up to just short of elbow joint. The wrist is placed in slight extension, with the MCP joints in 70 to 90 degrees of flexion, and the interphalangeal joints in 5 to 10 degrees of flexion. 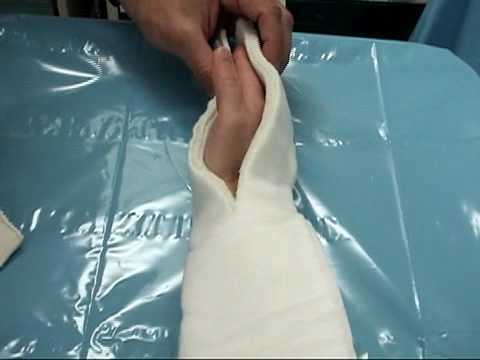 The splint covers the radial aspect of the forearm, from the proximal one-third of the forearm to just distal to the interphalangeal joint of the thumb. The forearm is in the neutral position with the wrist extended to 25 degrees and the thumb in a position of function. Imagine holding a glass or a cold drink can. This is the functional position of the thumb. Reduced, stable proximal interphalangeal joint dorsal dislocations. The splint is applied with the proximal interphalangeal joint at 45 degrees of flexion and secured at the proximal part of the finger crossing metacarpophlanageal joint. The flexion is decreased 15 degrees until reaching full extension over four weeks. Buddy taping should follow. Used most commonly in distal phalangeal fractures. The aluminum splint wraps from the dorsal fingertip around to the volar fingertip and immobilizes only the distal interphalangeal joint in extension. It is used in cases of mallet finger or avulsion of the extensor tendon from the base of the distal phalanx with or without an avulsion fracture. For this splint, the distal interphalangeal joint is placed in slight hyperextension with a padded dorsal splint, an unpadded volar splint, or a prefabricated mallet finger splint. The splint is kept for 6-8 weeks. Night splinting for an additional two to three weeks is recommended. Temporary immobilization of carpal bone dislocations or fractures (excluding scaphoid and trapezium). The wrist is slightly extended. The splint does not limit forearm pronation and supination. It could be a definitive treatment for wrist buckle fractures in children. It is used in the acute management of distal radial and ulnar fractures. The forearm is neutral and the wrist is slightly extended. The splint does not restrict forearm supination and pronation. Double sugar tong splint is used in the management of elbow and forearm injuries. First, a single sugar tong splint is applied as described above. A second sugar-tong splint is then applied, extending from the deltoid insertion distally around the 90-degree flexed elbow, and proximally to 3 inches short of the axilla. This splint also provides superior pronation and supination control. Acute management of distal radial/ulnar fractures in children. The splint extends from the axilla over the posterior surface of the 90-degree flexed elbow, and along the ulna to the proximal palmar crease. Slings are used to support an injured upper limb or to supplement treatment for another injury such as fractured ribs. There are many different slings, triangular bandages being most commonly preferred. the ‘collar-and-cuff’ or clove hitch for injuries to the upper arm and as supplementary support to fractured ribs. The splint extends from the plantar surface of the great toe or metatarsal heads along the posterior lower leg and ends 2 inches distal to the fibular head. It should always end below the fibular head as that would not put common peroneal nerve at risk. This splint is commonly used in acute ankle injuries, isolated undisplaced malleolar fractures. The splint extends from the lateral mid-calf around the heel and ends at the medial mid-calf The position of the function is with the ankle flexed to 90 degrees. This is the neutral position for the ankle. A bulky Jones splint is a variation on the stirrup splint used acutely for more severe ankle injuries. The lower extremity is wrapped with cotton batting and reinforced with a stirrup splint. This splint is used for the toe immobilization, distal metatarsal, and phalangeal fractures, particularly of the great toe. A plate is made by extending the casting material beyond the distal toes, prohibiting plantar flexion and limiting dorsiflexion. Upper extent is same as posterior ankle splint. The splint should start just below the gluteal crease and end just proximal to the malleoli. It is also called cylinder splint. The knee is positioned in slight flexion.